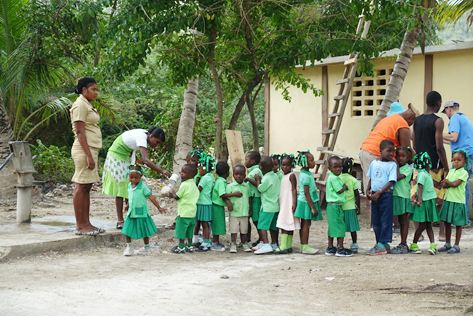 …kindergartners in bright green uniforms are lining up at the water pump for a teacher to wash their hands. Turning to our right, within a few feet, we see team members repairing school benches. 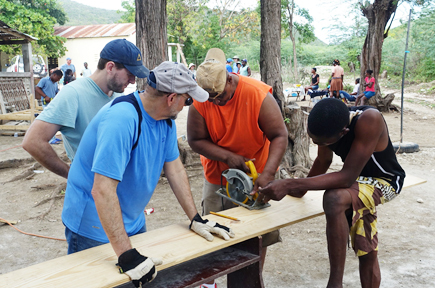 And young people—Haitians and Americans alike—are learning to use power tools. A few feet in the other direction from the pump, we find others who are building the forms for a concrete stairway to the roof, where a library is planned. 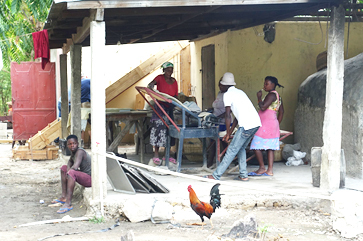 In the same space, village women are using the bread oven. Over and over they knead the dough through the heavy rollers. Walking on, maybe 50 feet beyond the bread oven, outside the main compound, we would see that local bosses and workers are building a shelter for the corn grinder. 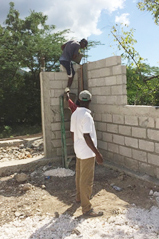 A team of Haitians and Americans dug the footer in January. Since then, local workers had put up the block walls and had the rebar belts ready to install—including the extra belt halfway up the walls (post-earthquake design). Let’s turn back now, the way we came, passing by the outhouse, to arrive at the kitchen, a one-room building in the central compound, where women are cooking over an open fire, chopping chicken and goat—and slicing cabbages, carrots, and onions ever so fine (in their hands!) for “piklis,” a spicy cole slaw. In the meeting room just opposite the kitchen, we come upon older students studying French and Algebra in the meeting room. They continue their class even though 20 of us are coming in and out for water and meals. Next to the kitchen on the other side, we enter the two-story school. 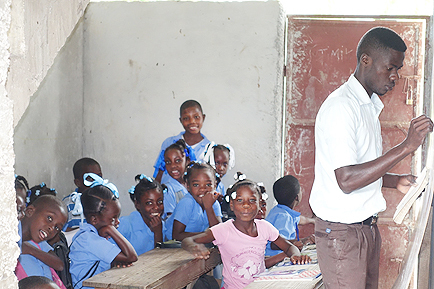 Primary age children in blue and gray uniforms, and older students in apricot and brown uniforms, are sitting on long benches as young men teach. One displaced class huddles under the stairwell. School goes on even though we have taken much of their space with our cots and suitcases. Stepping out of the school into the center compound, the church, just to our left, is bustling. A crew has been assigned to repaint the church and prepare it for a new mural. 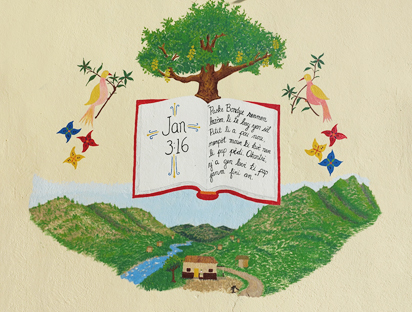 A small team of Haitians and Americans design a mural depicting John 3:16 in the context of this mountainous village. Inside, people are painting the walls during the day, practicing praise band every night, and worshiping in the Spirit on Sunday. 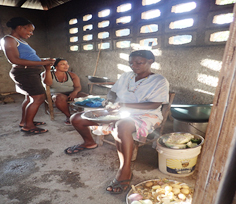 One evening there is a lively women’s gathering. 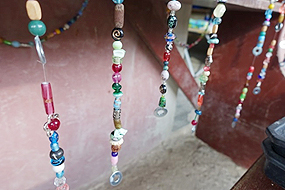 If we had stepped into the church during the women’s gathering, we would have seen, after a song and brief lesson from Philippians Chapter 1, each woman – Haitian and American—string about 5 inches of beads to represent her personal joys and sorrows, her hopes and anxieties. From these separate strands we created a wall hanging—one for each church—to remind us to pray for one another. This ensemble of beads represents the coming together of our prayers. It represents our partnership in the gospel! At the end of the meeting, after we had sung a praise song, we broke into joyous dance with our sisters in Christ, so happy to be together in the Lord.